Lately it seems that every race has its controversy, its storm in a teacup hotly debated with passion and reason, its opportunities for bashing or defending the drivers involved. A couple of weeks ago it was Kimi taking out Sutil in what was clearly a racing accident, no matter how unfortunate for both drivers. Now Lewis Hamilton, the most inventive of them all when it comes to creating new ways to exit GPs (and thereby stir up the punters), has wowed us with a stunningly original way to take out a competitor: boot the guy up the backside while he's waiting at the lights. It is only a pity that this method tends to ruin your own chances of winning too. Joking aside, I fail to see what the fuss is about (just as I must have missed the point in the Raikkonen/Sutil deal). Hamilton merely gave us a perfect demonstration of the classic traffic light rear-ender. He did not say as much afterwards, but part of his embarrassment must have been that he had fallen for the most common foul up on our roads today. Consider the circumstances; Hamilton is impatient to leave the pit, having seen his lead destroyed by the pace car and knowing that all the guys just behind him were pitting at the same time. But his team are filling his car with more fuel than the others and the inevitable happens - Robert and Kimi beat him to the punch. And now we have the scenario all ordinary drivers deal with every day - a bunch of cars nose to tail approaching a traffic light. If you have driven for a few years, you know what happens next. You're following the car in front closely, they're trundling along at the speed limit, you approach the lights, you glance up to see whether they're green or red... In that instant the driver in front of you brakes because he looked a second earlier and knows the lights are red. You look down and it's already too late - a collision is inevitable. That second or two you lost in checking the lights has been enough to transfer you into a space already occupied by the car in front. Remember, too, that Hamilton and Rosberg did not have the split second's advantage of seeing brake lights come on - F1 cars don't have them. So that glimpse at the pit exit lights was absolutely imperative to predict what the cars in front were going to do but also robbed them of the chance to stop in time. It is the fans who suspect Hamilton of deliberately choosing to ram Kimi rather than Kubica who make me laugh loudest; I know these drivers have super quick reflexes but come on, they're not superhuman. There we have it. The originality of Hamilton has introduced the rear-ender as another new way to exit a GP, an invention so brilliant that Rosberg was moved to copy it immediately, so dazzled was he. But that is not good enough for us; we have to pick it apart, imagine all sorts of ulterior motives, dastardly plans, accuse this one or that of stupidity, anything but accept that this was a simple accident caused by cars following each other too closely (which happens in racing, especially if you bunch them all up in a narrow space and limit their speed). Much more interesting than the question of why it happened is to ask why it has not happened before. And the answer to that one is in the statistics - there just weren't so many opportunities for this kind of thing to happen before the new safety car rules were brought in. Up until the Canadian GP, the red light was becoming notorious for ruining the races of those who did not notice it was on; now we know what happens when they do and stop as instructed. There is a lot of debate about why the pit exit should be closed while the other end remains open - all explained by the necessity to hold cars back while the pace car and its train are passing the exit. But why is nobody pointing out the fact that the whole silly business is caused by unworkable rules being introduced without consideration for their side effects? The new rules were introduced to stop the pit lane becoming overcrowded as soon as the safety car comes out. As we saw in Canada, they have failed miserably in preventing that situation and have only created several other opportunities for things to go wrong. Let me ask a question: when exactly, before the introduction of the new rules, did we see accidents in the pitlane caused by overcrowding? Maybe my memory is at fault but I cannot recall a single instance. It is just another example of the FIA fiddling while Rome burns; make fancy new rules to cover situations dreamed up in your imagination and then add adjustments as events prove your idea to have been unnecessary and flawed. Mr Mosley has done such a great job, hasn't he? I have said before that the problem lies even further back than the introduction of the new rules - the safety car was an ill-conceived idea in the context of F1 and it has ruined more than its share of great races. Of course, I know it is too late now for that mistake to be rectified; we have become used to its appearance and the artificial reshuffle that it creates. But I can dream of it finally getting the boot by the introduction of a better way of handling accident situations, can't I? Maybe there is some genius out there who can suggest a method of slowing the cars to a safe speed without forcing them to bunch up into a traffic jam. I wonder if Max has ever introduced a rule that didn't need to be changed 27 times before it was thrownd out. The actual root cause of this accident and many others are the utterly artificial compulsory pit stops Max introduced to create changes of position because he was clueless how to write technical regs that would let the cars race and after Imola 94 he didn't want on track overtaking because of the risk. I have said many times to me a grand prix is 26 cars leaving a green light and arriving at a chequered flags with only their drivers touching them. Pits stops are unnecessary and screw up races and everything Max has introduced to sort out the results of unnecessary pit stops has made it worse. Watching Senna qualify was one of the great joys in life because you knew on that day that he was that much faster than any other car and driver combination and that his car could not have gone any faster. I believe we saw a magnificent pole position lap on Saturday but two days later I don't know if it was that good or if the car was lighter than the rest. I hope whoever replaces Max has better planned for us. I see Alain Prost was doing interviews in Montreal again. He must be serious about the FISA job. Prost has already said that he's prepared to do the job if asked, while all the politicians are staying quiet. That says to me that Prost is an amateur when it comes to political manouverings and, as far as I'm concerned, that is an excellent qualification for the position. We don't want lawyers, we don't want politicians, we don't want businessmen; give us someone who has an understanding of the sport and let Bernie or his successor take care of the money. Just force-remote enable the pit-lane speed limiters. There, problem solved. They trundle around the track at 50MPH / 80MPH (OK, maybe have a higher speed 100MPH version if you must), limited to a silly low speed (Like being behind the pace car), keeping their spacing. They can pit if they like, they can drive how they like, everyone does the same speed, and they get a 3-2-1 countdown to the limiter being taken off by lights on the wheel (So they don't get a sudden jolt of acceleration throwing them off the track). Easy - they've got a unified EMS already, so just build it into that. Remote communication with the car is already used by the teams and the FIA (blue-flag indicators on the wheel). I think we've found our genius! Excellent idea, Lazer, elegantly simple and surely effective in preserving the race positions without giving away artificial advantages and disadvantages. I think Kimi deserves a three race ban for clearly brake testing our boy Lewis Hamilton. Hehehe, James, you're not on TV now - you can tell us what you really think! I was thinking on the speed limiter used while pitting as a real posibility. But MrLazer has made the point, for sure. On the other side I have to disagree Clive on this question. 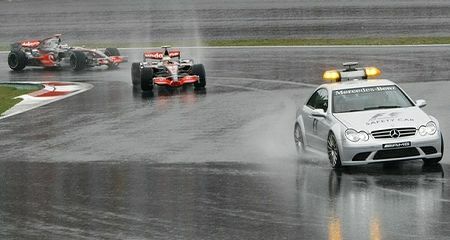 Safety car wasn't bad at all untill this recent rule management. In fact, I liked a lot to see who was the most intelligent driver and the most talented team to make a good strategy of a SC, taking advantage of it. And those driver throwing themselves as Mad Max to be the first to pit was exciting, and part of the race itself. In fact, all we need is to be sure that they're slow just where the track is dangerous, and then let them race, for god's sake!!! But, Architrion, what you say about slowing where the track is dangerous is exactly what used to happen before the safety car was introduced! I can see why some might enjoy the strategies that go along with pace cars but, to me, they rob the guy who has worked hard to build a lead and reward those who are prepared to risk their own race and others' by going wild as soon as the pack is released. When you add up all the problems the SC has caused over the years, it seems that it's just not worth all the extra complication. I honestly stopped reading after this line and have not read any of the comments either. Normally, I wouldn't do this and prefer to take in as much information as I can before commiting fingers to keyboard, but I'm afraid a completely disagree with that line. I must apologise in advance if your words, Clive, are put in context later on in your fine article (because I know that it's damn good either way you've fallen on this particular incident) but I felt the need to comment before continuing my read. Lewis Hamilton was not closely following the other cars in front and had plenty of time to react properly and correctly before he ploughed into the back of Raikkonen. Given that the speed limit was ~50mph (80km/h) and and the braking distance of F1 cars is impressive to say the least, to say nothing of the reaction rates of F1 drivers being among the fastest among us mere humans, Lewis made a mistake. The cars in front of him - two abreast - had stopped. Stopped! Maybe he was thinking about what to get his father for Father's day, or what will happen in Big Brother this year, who knows? He clearly wasn't looking where he was going and failed to react to two cars in front of him stopping. Stopping! It was a silly mistake. A bloody stupid mistake, if I may add. I think it's all in the point of view, Ollie - and from where Hamilton and Rosberg were sitting, it was very difficult to see whether the car in front had stopped or not. Sure, the gap looked long enough from our point of view (almost directly overhead) but, when you're sitting with your head very low and directly behind a car, the signals that tell us that it has stopped are very small and take time to notice. Years ago I lived in Africa and there was a railway line running near my house. I had a dog, too, a red bull terrier named Rufus, and we would often cross the railway line to walk in the open bush beyond. One day Rufus ran on ahead as we approached the line and then chose to sit down between the rails. There was a train coming and I yelled at him to come back but he was in one of those moods when a bull terrier chooses to be hard of hearing. He sat on, quite unconcerned, even though he was facing the train and could see it clearly. The point is that, because it was coming straight for him, he had no way of telling that it was getting closer very quickly, apart from a very gradual increase in size. In the last few moments, that increase suddenly escalated but by then it was too late - the train ran right over him. God protects fools and bull terriers, it seems, for he was ejected summarily between the wheels of the engine, unharmed apart from an oil streak running along his side and with a completely new respect for railway lines. Hamilton's seemingly inexplicable crash (and Rosberg's) was, in fact, almost bound to happen sooner or later in that sort of situation. I think this was the first time we've seen as many as four cars heading down the pit lane towards a red light at 50 mph. It was a mistake by Hamilton, yes, but a completely understandable one, I think. I too had a good laugh at the conspiracy theorists who suggested he took Kimi out rather than Kubica. Hey, maybe it was Elvis driving the car too ! Just a silly mistake, is all. Look on the bright side, Lewis has made a few silly mistakes now - but never the same one twice, so the boy is learning. One day, surely, he'll have made them all and then we'll see what he is made of. I see one of the other sites in your empire has stopped taking comments again. I had to comment on this story though. Ferrari's wheel covers were causing high temperatures. Surely the justification for these devices was that they were not aerodynamic devices but part of the brake duct to aid cooling. Have Ferrari just announced what we knew all along that they were lying and Max and his cohorts were either stupid enough to believe them or the FIA was back in Ferrari International Assistance mode. If Ferrari are at last admitting that these are aero devices then they should be banned and they should be punished and Max should be fired. I hate being lied to and I especially hate it when I know I am being lied to and the people in power couldn't care less. Max, Ferrari ahve just told the world you are an idiot. Ah Clive, finally a voice of reason among the chatter. I have to say that I had despaired at the utter rubbish being bandied around on some of the other blogs with regards to this incident. Like you, as with the Sutil/Raikonnen incident at Monaco, I failed to see what the fuss was all about. As for your thoughts on Prost and the FIA presidency, well, one can only hope. I can think of people who would do a far worse job. Prost is intelligent, thoughtful and, most importantly of all, has racing in his heart. However, if he were to stand for election, would that automatically prejudice the touring club members against him? I said it at the time Ferrari introduced the wheel covers, Steven - they were obviously aerodynamic devices and the brake cooling nonsense was just an excuse. The FIA were clearly in Ferrari International Assistance mode at the time since they accepted the reasoning that the primary intent was to cool the brakes, even though the aerodynamic advantage was so evident. Primary intent? I don't recall that being written into the rulebook - in fact, Renault's mass damper had the primary intent of controlling judder over curbs and, if it had any aerodynamic effect at all, that was purely incidental. Since the FIA are so intent on cutting costs, they should have been at pains to prove the covers illegal, not bending over backwards to let Ferrari have them. Now every team has had to develop them at considerable cost in money and man hours and Ferrari's brief advantage has been dissipated. What on earth was the point, apart from trying to manipulate the championship? As regards Formula1Sport, the site has been under attack by a hacker for some time now and yesterday it collapsed for several hours. I can only apologise for the inconvenience and assure you that it is back up now. The problem should be solved permanently soon as I am working with my son to transfer the site to another server. Big changes on the way which I shall announce as soon as I know the timescale. That's an interesting point about the touring clubs, George. It may be that their view on Prost will become irrelevant since it looks very likely that they will break away from the FIA. But, if they stay, one can see them demanding a non-motor sport president in future. And they would have a point. Their contribution to the organisation is considerable and the presidency has been in the control of the motor sport section ever since FISA was done away with. It seems only fair that they should have a turn at the wheel now. But the real problem is that FISA should never have been absorbed into the FIA. The two sections obviously need separate organisations to administer their affairs, so different are they. Ideally, one would want a new FISA governed by a motor sport boss (Prost, for instance), another office, again with a man from touring in charge, to deal with those matters, both to be overseen by the FIA and a president with a more general background (but not a lawyer!). Not that it will happen, of course. Yes, I think that you are right Clive. Control of motor sport had been delegated by the FIA to formerly the CSI (ommission Sportive Internationale) and latterly the FISA (Fédération Internationale du Sport Automobile) from 1922 to 1993. The abolition of FISA and the move to bring the control of motor sport back under the firm, direct control of the FIA was, of course, directly the doing of Max Mosley, who wanted to consolidate as large a power base as possible. Mosley was and remains a frustrated politician, who has used the influence and authority that his stewardship of the FIA has given him to compensate for the fact that, due to his family history, a career in British domestic or European representative politics was unrealistic. The solution would be to return to a structure more in line with pre-1993, as you suggest Clive. This would enable both 'arms' of world motoring to receive the attention, expertise and leadership that they require. It would open the door for someone with a real understanding of motor racing to provide leadership of global racing activities. There are a number of candidates that you could imagine filling this position very well indeed (Prost being one of them). We can dream. Prost is proposing splitting the FIA and the FISA, so I would think that the touring clubs would approve of him because it would negate the purpose of breaking away themselves. I'm with Ollie on this incident - drivers do not normally need as much space as Hamilton apparently did to figure out what was going on and react accordingly, and besides the regulations clearly state that red lights in the pit lane mean stop (which means that a driver in the pits should be prepared for the possibility of a queue on any occasion they are in the pits). If Hamilton wasn't prepared for the possibility of a queue, then it's his fault. Simple. I think our disagreement on the Hamilton incident is merely one of scale, Alianora. No-one is denying that it was a mistake by Lewis - I am merely saying that he does not deserve the ridiculous amount of abuse that has been thrown at him as a result. You say a driver does not normally need much space to see what is ahead of him but that is my point, in fact. The situation was not normal, never having been encountered in F1 before. It is easy for us to view the thing from outside and sit in judgement - not so easy when you're the driver in the actual circumstances. The fact that Nico made the same mistake indicates that something other than inattention was going on and we merely guarantee that there will be recurrences of that sort of accident if we dismiss it as stupidity on the part of Hamilton. In the Prost interviews I have seen he has been at pains to point out that he is not interested in the existing FIA job but would like to be effectively the president of FISA. As everyone know that organisations should not have been thrown away but after Max used the FISA presidency to mount his assult on Balestre he made damned sure no-one else was going to do the same to him. Sod the sport - protect Max. I despair of racing fans sometimes. After Monaco Hamilton was fabulous now he is a complete idiot. It is almost like some people have their brains wiped on the Thursday before a race. I have read a few comments to the effect that Coulthard's performance may have saved his Red Bull drive. Why? He is the same driver as he was when he went off in Monaco. He hasn't suddenly massively improved in two weeks just as Lewis hasn't suddenly be Taki Inoue. Coulthard is and always has been a very good driver and well worth his place in F1. He has done so much for Red Bull including proposing they sign Adrian Newey and convincing Newey to sign. Why get rid of him for an unproven driver? This is not the first time a driver has encountered a queue in the pit lane. The trouble is that the first example that comes to mind is Massa and Fisichella at Canada last year - when they saw Davidson, they slowed down enough that they could have stopped... ...but then decided to nip round him instead of joining the queue. Predictably this resulted in them getting black flags, but at least Davidson had the opportunity to have his race ruined by a groundhog instead of another driver. The circumstances were sufficiently similar that it is reasonable to have expected Hamilton to stop - especially as the pit lane arrangements would have given Hamilton more time to consider what was going on. Ros berg's interpretation of events supports that view - if he made a mistake, then Hamilton with more space to manoeuvre must also have made a mistake. Besides, the pit lane speed limit is that low because of the necessity for cars to stop quickly. To say that the circumstances made it impossible for Hamilton to stop in time is to imply that the speed limit should be lower than it is for the safety of those within - if Hamilton could not have stopped for a car in that gap, he wouldn't have stopped for anything else either. Steven: Your example is not the same, Alianora - one car doth not a queue make, it's an obstruction with room to pass. It is interesting that both Massa and Fisichella chose to pass Davidson, however. It seems that neither of them had noticed the red light - how strange. As for Rosberg, he confirms my story in that he says, "I saw the red lights too late..." Couple this with Massa's and Fisichella's experience and it begins to become clear that the lights at Montreal are not easy to see until you're very close to them. This would be confirmed by the way Raikkonen and Kubica had to jam on anchors at the last moment. So it is entirely possible that Hamilton could not see the lights until it was too late. He should have been watching the cars in front, maybe, but the lights have become such an issue with so many being penalised for jumping them that it is understandable that he should have been looking for them. F1 cars stop on a dime - but that is a fairly big dime, even so, made bigger by the driver's reaction time. Remember that the cars were approaching the lights at 50 mph, not the 30 mph we are used to in everyday driving. It all points to there being something about those Montreal lights that causes mistakes again and again. Whether we like it or not, the stopping distance for any car is greater from 50 mph than it is from 30 mph. If the authorities think that 50 mph is a safe speed, then so be it - but it is still an arbitrary figure plucked from the air. It has not been tested for the circumstance it is supposed to counter - a mechanic stepping backwards into the path of an approaching car. All then will depend on how far away that car is. Steven: Oops, I typed your name but was thinking about my response to Alianora and it all came out in a rush. Sorry about that! The fickleness of so many F1 fans is one of the reasons I wrote this post - plus their easy dismissal of a driver's error as the action of an idiot. As I have said before, none of them go deliberately into an accident. I felt the Massa/Fisichella/Davidson comparison was legitimate partly because the thing that indicated a stop was necessary was the same length as the Raikkonen/Kubica/Hamilton/Rosberg incident (i.e. one car); the only difference is that the "escape" route was blocked because there was twice as much width. The light may not be easy to see, but the car(s) at the end of the pitlane are considerably easier to see than Lewis made out after the incident (he claimed on ITV that he hadn't made a mistake or a racing incident, but couldn't come up with a suitable label for his situation). Frankly, if Hamilton could not see two cars in the distance he had and react to it, then the position of the red lights wouldn't have made any difference. Raikkonen and Kubica wouldn't have slowed down until the last minute, regardless of whether they'd seen the light or not, because Ferrari's premature release of Raikkonen effectively meant that they were racing each other to the line. If one had slowed before the other, the one slowing down first would have lost a position in the queue - which would have meant losing a position in the race. While it is possible that the red light's poor visibility could have created the same situation even if only one of the two had been going down the pit lane, the circumstances were such that it cannot be automatically ruled in. Ferrari should have been penalised for that early release but weren't. Hamilton and Rosberg were not running alongside anyone and therefore did not have Raikkonen and Kubica's excuse. There probably is something wrong with the lights (in general and in Montreal in particular), however this does not explain Hamilton and Rosberg's actions. As a pedestrian, you learn to pay attention to everything around you when crossing a road - if a car is going to occupy the pedestrian crossing space at the time you want to cross, it is completely irrelevant whether the pedestrian light is red or green, you still stop on the pavement. I do not see why a driver would be held to a lower standard than a pedestrian, especially in the confines of the pit lane when the need to observe everything is arguably higher. I have since seen that McLaren warned Lewis about the lights, but there wasn't enough context to know if this was in sufficient time to have been of use to him. However he shouldn't have needed it - pit lane obstacles generally don't come accompanied by radio warnings. I still maintain, therefore, that Hamilton was not driving with due care and attention and that the deficiency was larger than can normally be expected of a driver at this level. Some of the abuse isn't deserved, but given Lewis' prominence in F1, there's not a lot that can be done about it :( However, this is a serious mistake that was basically his fault, and of course he will be roundly criticised for it. One point where I would agree with Clive is that the speed limit is arbitrary and untested, which is a bit strange for a safety rule. There should be some sort of test done to find out exactly what constitutes a safe limit for the pit lane, if indeed the FIA insists on there being one. I don't think we'll ever agree completely on this one, Alianora - I see it differently from the way you do, that's all. Hamilton has compounded the problem by his evasive statements after the event, certainly, and this has helped to blow the thing out of all proportion. With a new system being tried in France, we may see the red light fade from prominence anyway and we can get back to discussing actual racing!